As we sit here in 2017, sales and marketing is still the same – and totally different. In my long career that actual fundamentals of sales and marketing haven’t changed a bit (contrary to the belief of some). However, the platforms, technologies and tactical methods have changed and will continue to change dramatically. This is the nature of sales and marketing. Once any single method becomes mainstream and very popular, the ROI of that activity usually will go into a long decline. And as technology changes new tactics replace old ones. As an example, old time magazine display advertising is long gone; but pay per click and banner advertising on the web is a new form that is alive and well. One of the more interesting new approaches that has entered the mainstream in the past few years is B2B social selling and marketing. According to LinkedIn, B2B social selling leaders have 45% more opportunities per quarter than social selling laggards. Social selling leaders are also 51% more likely to hit quota than social selling laggards. LinkedIn also found that “farmer” reps who exceed quota share 23% more content each month than their counterparts who don’t make quota. IDC says that B2B buyers who are active on social media represent a more senior/influential segment than those who don’t use social media to support their purchases – and that their budgets are on average 84% higher as well. In a survey on how B2B buyers view sale professionals, LinkedIn found that 89% of buyers “turn away” if the sales rep doesn’t show insights or specific knowledge about their business. Social media enables that opportunity to show off as a “thought leader”. 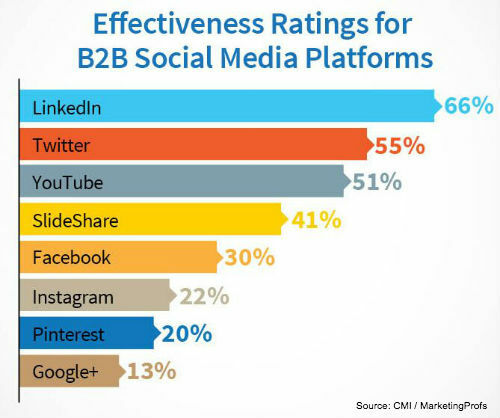 The CEB found that the most important behavior separating top sales performers from average sales performers is the use of social media as an important channel to engage prospects and generate leads. Sales Benchmark Index research shows that B2B Social selling enables reps to realize 66% greater quota attainment, compared to those utilizing more traditional selling techniques. Of course, “social selling” is a generic term which includes many different technology platforms. A basic tenet of marketing to is to go where your customers congregate. In B2B technology selling that usually means LinkedIn rather than Facebook, as a general rule. But this isn’t true in all cases, so it’s important to analyze the specific patterns of your market segment. I like to use as many social platforms as possible as this provides leverage for your content creation activities. If you’ve created a great article for your Blog, posting it on multiple social media platforms such as LinkedIn, Twitter, Google+, Facebook, etc provides a greater exposure bang for your creative buck and is pretty quick to do. This is an area that automation can increase productivity, making posting to multiple platform very efficient and quick and has no downside that using automation is some other areas of social selling might (see discussion later in this article). Everyone tends to think of the major social platforms first in B2B social selling, but one platform type that many often overlook is the vertically-oriented communities which are specific to your market segment. These communities might be found in a LinkedIn or Facebook group, bu may even be congregating on older platforms such as Yahoo/Google groups. Regardless of platform, the discussion and relationship building in these vertically-oriented communities can be much richer and more relevant to the participants. So don’t overlook those opportunities. Otherwise, the graph above represents a pretty solid hierarchy of the importance of each major social platform in B2B sales. The one exception is that I would value Google+ higher than the graph does; for obvious reason Google+ postings tend to rank higher in the Google search results than comparable postings might. The takeaway is to prioritize the platforms important for your business in order of importance, figure out how many you can realistically participate on given your ‘social sales and marketing time budget” and utilize automation wisely to actively engage on as many as possible. This may be the hardest thing for the classic outbound sales rep or marketer to adjust to. Don’t sell the product? — what, this is blasphemy! At least don’t sell upfront. Industry insight and knowledge trumps the pitch in social selling. B2B Social selling and marketing activities work best when they are thought of as “pull” rather than “push” oriented, to use some now old-time marketing terms. Your initial goal is to form relationships with of folks who might someday buy your product. Some of them possibly very soon, but most of them not so soon. So rather than ‘pushing” your product at them, pull them toward you with compelling content that they won’t be able to resist. Your initial focus in social sales and marketing should be in assisting and educating. Give first, receive later. And I don’t mean “product” education, but on topics that are of interest to the group you hope will someday become customers. But not specifically about your product. Not yet, that comes later. Most prospects at this stage aren’t out actively looking for what you have yet – if they were, they would likely become known to you via other means such as visits to your website, etc. And one of the key benefits that accrue from social selling and marketing is the ability to find buyers very early in their sales cycle, often before they even know they should be looking! The best ways of engaging on social media is to start a relationship based on some overlapping personal or professional interest. Always offer to be helpful and turn yourself into a valuable information resource by posting helpful content that your core audience would appreciate. Much of this would ideally come from a company Blog that will help position you and the company as a thought leader and expert in the space. But if that content doesn’t exist, curate specific, helpful educational content from the great worldwide web. In keeping with the personal, relationship-building theme, in most cases it’s best to post content from individual sales or marketing reps personal social accounts, rather than just a monolithic brand account. You can also post the content within the brand account pages, but content forwarding is best done in a personal manner – individual to individual. Sales reps can utilize such content to position themselves in a consultative light, which will come in handy further down the sales cycle. Later when a prospect is more ready to engage in a more traditional sales process, they’ll think of you first. Who would you rather buy from, a consultative rep or the one who accosted you from day one with an aggressive, product-focused pitch? Social media sales and marketing takes time. There is no way around it, it is a labor-intensive exercise. If you do it RIGHT, there are automation efficiencies that can be gained. But it just isn’t a “zero resource” activity that can automated to a significant extent such as a PPC or email drip campaign. There are definitely quite of number of automation tools out there that can be helpful. But I would caution against the over-use of them. If you use them broadly to approach prospects, the lack of personalization can be a real turnoff to potential customers and partners. Have you ever received an outreach message on LinkedIn that is obviously automated? I receive them all the time and I ignore 99% of them. By the very nature of automation you begin to lose the targeting that a well crafted, personalized outreach provides. Remember, this activity isn’t about pitching but building PERSONAL relationships. Mass methods are a great way to begin a personal relationship. I’m not saying these tools can’t be useful. If you can really categorize your targets into very tight buckets your messaging might not hurt you. If you can use automation without losing the “personal touch” by all means go for it. But I would use automation with caution and evaluate whether the efficiencies gained out-weigh the personal touch that is lost. Again, personal trumps volume here. Remember, you only get one chance to make a first impression. So what do you think – is B2B social selling and marketing the way to go today? Exclusively, or do other methods still matter? Where does it fit into YOUR sales and marketing mix today? I’d love it if you could add your opinion and experience to the conversation by posting a comment below.